I should have known that when I had strange birds hanging around the house, I'd eventually have them move in. I don't have a problem with that at all. A while back I had a bird come out and stare at me when I was out in the yard taking random pictures. 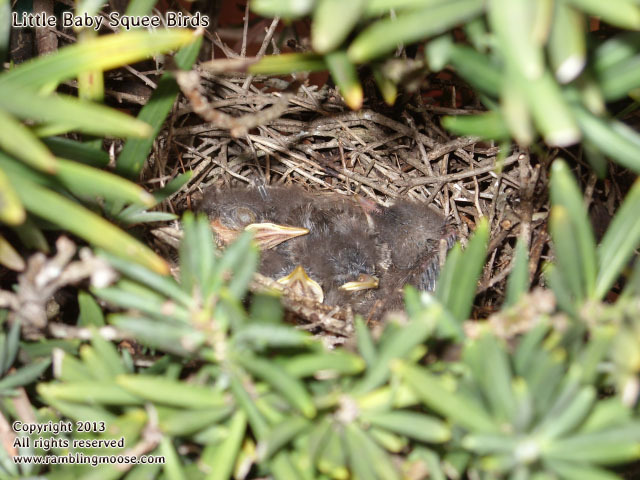 After I found that there was a bird roosting in my Podocarpus, I knew that there was a picture in store. I was out untangling the flag from the pole in front of the house. Struggling with the new flag pole mount on the house, it's a little too tight and a little too high for me to just reach up and grab it like I did on the old one, I was getting some attitude from a bird. Now I have the entire story. It was the Momma Bird that I saw on the tree near the house. 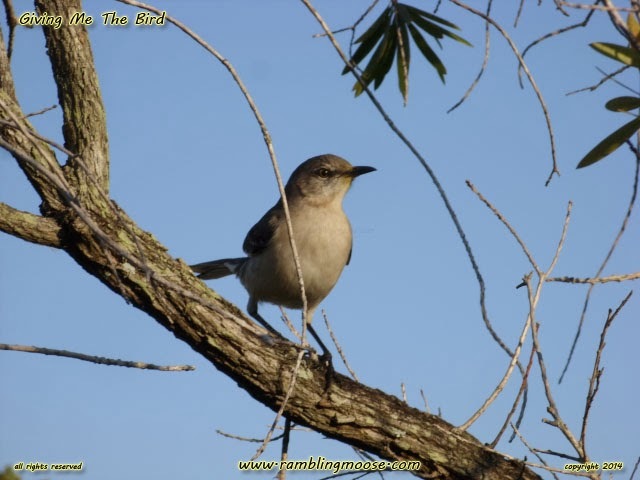 In this case, Momma Bird is a Northern Mockingbird which is ironic since most of their range is in the South. Actually, Momma Bird was perched next to the fake plastic Owl that we have there to scare noisy birds away. I went about my business, removing the plastic eagle on the end of the pipe and went back in the house to get my camera. Sticking my nose in the Podocarpus, I saw these four little gems. Mouth open, eyes barely open, I fired off six pictures then left them alone. Typical photography, this was the only one in focus. I really need a Digital SLR, so if you have one gathering dust, write me. But begging for old hardware aside, my trusty old digital camera did a nice job of this. This isn't the first time I have had this experience. When I went up to Deltona to get my dog Rack last year from the Dog Liberator's shelter, we stopped off at Harvey's Groves fruit stand at the end of their season. Walking into the shop, we flushed out a bird from their podocarpus. 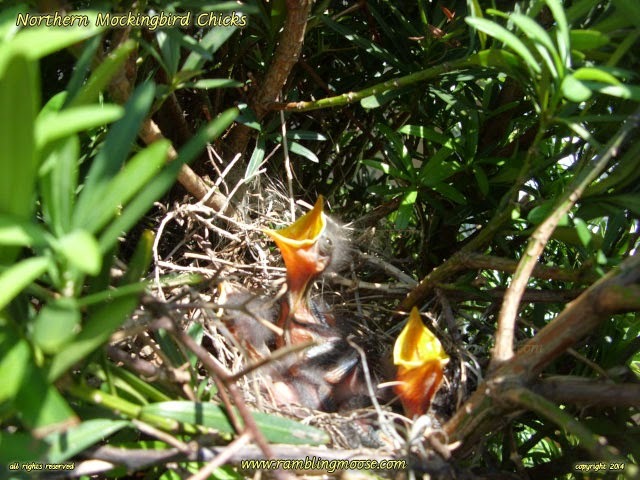 They make for a great place for birds to nest, very thickly limbed and leaved, the plants are quite common here in South Florida as hedges and accent plants. Having these creatures growing in my yard, I now am in this mode where I'm feeling protective. So far, they've been quiet and Momma Bird hasn't felt threatened by me. I discovered them while going out and pulling weeds from my grass. These weird daisy looking weeds that take root and grow from a tuber in the lawn if you don't pull them are all over the place here, and my gardening is as uneven as my housekeeping is. I was within a few feet of that particular podocarpus and Momma Bird flew out over my head, perched on top of the flag I had just replaced, and scolded me with a racket. Tough, Momma Bird, you don't pay my bills or my mortgage, but you're welcome to stay put while you need the space. Just let me get this weed ball out to the trash bin for tomorrow. I guess after all this time, my own little mystery is solved. I have been watched over by some Northern Mockingbirds for a while, and with the Ducks, snakes, and various lizards I have here, I'm in good company.